The T-Mobile Vibe has been unveiled, with the ZTE-made phone pitched at social network addicts on a budget. 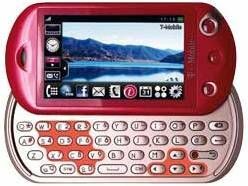 The T-Mobile Vibe features a 2.8-inch touchscreen with a QWERTY slide-out keyboard. The handset will be available for £39.99 from launch as a pay-as-you-go phone – making it pocket friendly in a completely different way. "The successful Vairy Touch series offered an affordable touchscreen user experience for T-Mobile customers," said Nicola Shenton, head of handset and device marketing at T-Mobile UK. "The T-Mobile Vibe reinforces our commitment to delivering the best quality handsets to our pay-as-you-go customers. "With this handset we are able to offer the touchscreen experience together with a full QWERTY keyboard previously unseen in this pay-as-you-go segment." The phone features an integrated FM radio, media player and Bluetooth along with a 2MP camera and a 2GB memory card. The phone is available in black or pink, and will sit alongside, rather than replace, the T-Mobile Vairy Touch II.